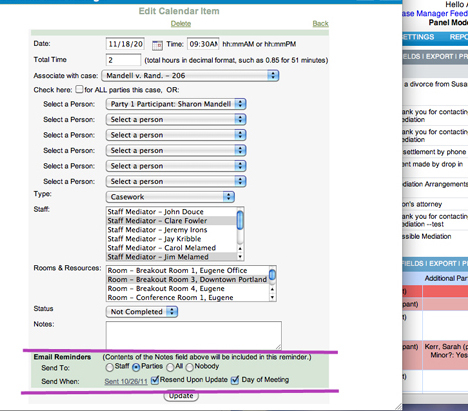 Caseload Manager can alert your staff and parties of upcoming appointments and meetings. 1.) When you create a new calendar item you will see new options at the bottom of the screen. 2) The default is that the item will not be sent. But by checking one of the buttons your item will be sent to the staff involved in the calendar item, the parties involved, or both. 3) You can also decide if you would like to send the alert immediately upon saving the item, the day of the meeting or both. This alert will be emailed with the relevant details to the email address that has been entered for that person.